The ILC Relay is a series of interviews everyday people who are learning about, and working for, the ILC. Our next relay runner is Mr. Kotaro Watanabe, an employee at Oshu City, which contains the northern part of the ILC candidate site. When did you first hear about the ILC? I first heard about the ILC in 2013, at a lecture. I’d worked in Oshu City since 2007, but I hadn’t heard the word “ILC” before that. At the time, I felt shocked preparations were being made for such a huge international project to come here, and confident that the ILC would transform this area’s future. Soon after, I was given the opportunity to work at Iwate prefecture’s ILC section for a year. When I was working at the prefecture, the site evaluation committee was deciding where to build the ILC within Japan, so workers had one job: steadily preparing the massive amount of materials that the site evaluation committee needed. Not glamorous work, but rewarding work, because it was our chance to promote Tohoku. A big turning point was when the ILC candidate site was announced, four years ago on August 23rd. As a crowd of reporters looked on in a room in the prefectural office, we watched the press conference on live TV. When I heard that announcement— “We determine the Kitakami site to be best suited to the ILC”— that was the most rewarding moment I’d had in my life. Currently, my job is building enthusiasm for the ILC to encourage the Japanese government’s decision, and working on elementary and middle school classes. I hope these kids, who will be our future leaders, will be inspired by our classes to connect their dreams with the ILC. The ILC holds countless possibilities: for many new jobs, and not just for researchers, and new business chances from the researchers and tourists who gather to visit the ILC. Without a doubt, the ILC will become a point of pride for this area and a local source of strength. What do you think will happen to our jobs the next few years? Hmmm, I wonder! I know we’ll be busy….Right now, our main job is to build enthusiasm for the ILC, but after the decision is made to host the ILC, I think our jobs will take a sharp turn toward full-fledged preparation for ILC researchers. For example, Oshu City will be one of the cities containing the ILC candidate site, so we’ll need infrastructure for research facilities (city roads, water and drainage systems…). 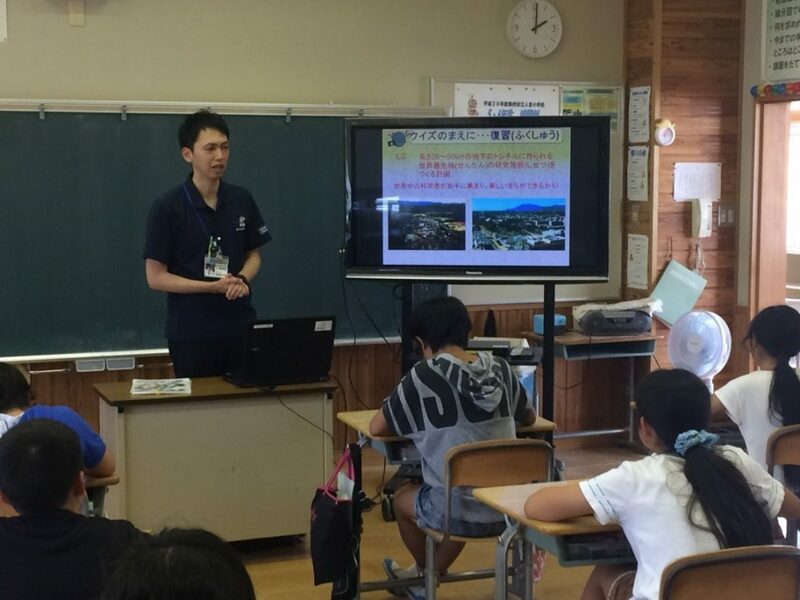 Oshu City has been working with Oshu International Relations Association for 4 years (since the Kitakami site was selected) to put support systems in place for foreign people like the city’s multilingual newsletter, and OIRA’s volunteer medical interpretation system. However, we’ll need to prepare even more thoroughly, for example translating more paperwork and signage into foreign languages. It’s been a year since I went on a vacation to see CERN, which is a model case for the ILC. I teach children about the ILC, so I needed to see and feel what CERN was like, to experience not just the research facilities, but the environment surrounding CERN. Around 90,000 tourists visit CERN each year. The day I visited was no exception: there were tourists everywhere. 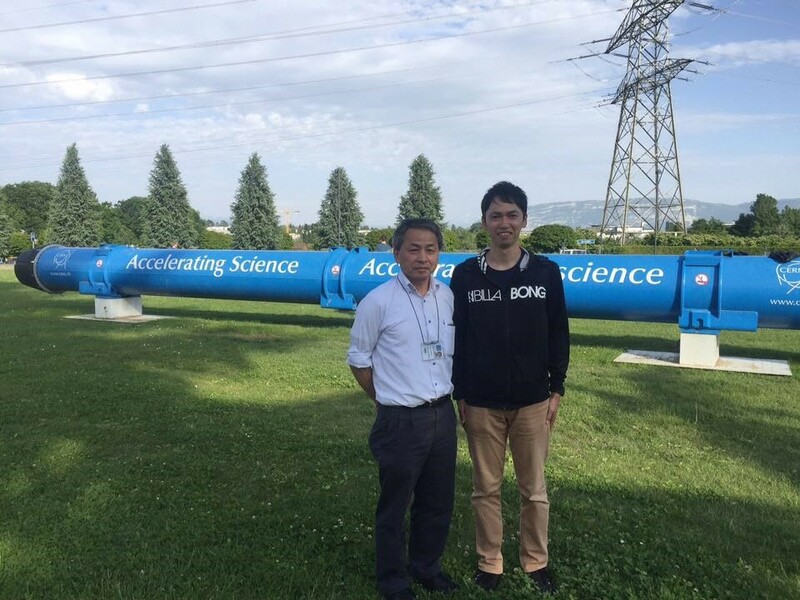 I joined the free tour of CERN, but I was also really lucky that former LCC Asian Director Dr. Akira Yamamoto was at CERN and did me a huge favor by guiding me around. The facilities that the general public could enter were limited because of terrorism concerns. The cafeteria now needed a badge to enter, but I was able to go in and see it thanks to Dr. Yamamoto. I visited during the weekend, but the outdoor café at CERN was filled with young researchers. They were chatting, or playing card games. People getting together to relax and chat will bring about new ideas and connections. I think this kind of place will be vital. I hope for an ILC campus open to the public with restaurants serving local food where residents and tourists can gather as well. CERN places importance on “science for peace,” and even the workers at the fire station within CERN are stationed through international cooperation. I felt that everything, not just the research, was being run by countries working together. At CERN’s “Globe” visitor center, local people and tourists can learn more about CERN’S history and purpose and is seen as a symbol of CERN itself. What final messages do you have for our readers? My final message is about Oshu City’s ILC City Development Vision, which was completed in April 2016. The vision outlines a course of actions to make Oshu even more wonderful, emphasizing what ways we can link the ILC to our hopes and dreams for the area, not what the ILC will do. For example, the elementary and middle school ILC classes I’m working with now: in the future, I’d love for ILC researchers to come to schools for these classes. I want foreign researchers and their families to feel at home in our community, so that various cultures can make this area diverse, and new connections between people can be formed. Through these new connections, we want to build a vibrant city together.